Are you dwelling too much on your losses? In the Five of Cups tarot, three cups are knocked over. The cloaked figure is focused on their spilled contents – the wine of life – while he ignores the two full cups behind him. Someone seems to be feeling sorry for himself, right? However, a closer look at the Five of Cups card tells a somewhat different story. The scene shown here takes place on a theater stage. This means you are looking at a psychological process, rather than an actual event. The man in the long, black cloak is looking at the cups’ spilled contents. 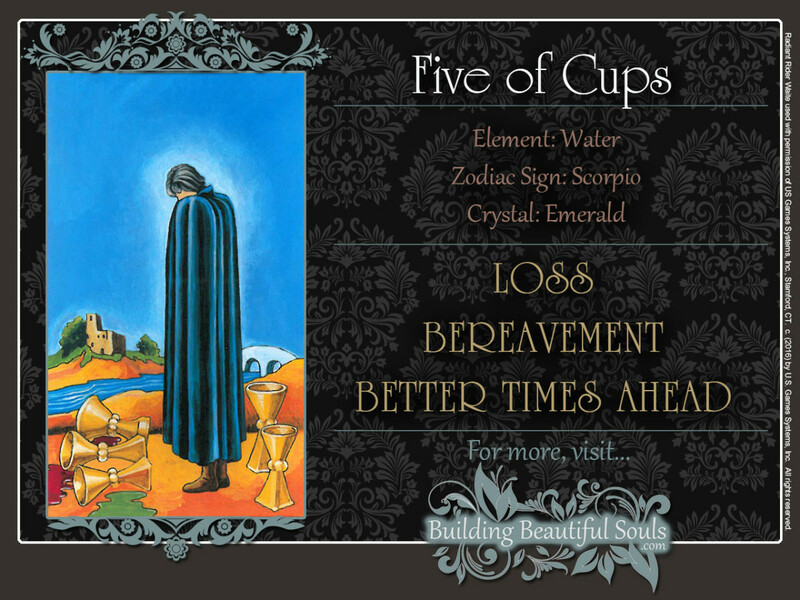 Since you can’t see his face in the Five of Cups, it’s hard to tell whether he is mourning or studying them. The fluid from the bottom cup is green, so it’s not wine that was in these cups. Like today’s practitioners of Ayurvedic medicine, medieval physicians believed that illnesses are caused by an imbalance of the elements in the human body. In medieval medicine, these elements were associated with bodily fluids called humors: blood (red), phlegm (green), choler (yellow), and melancholy (black). Sanguine persons are passionate, phlegmatics are laid back, cholerics volatile and prone to anger, and melancholics withdrawn and sad. As the upper two cups of the Five of Cups tarot show, the dizzying passion of the Two and Three of Cups has been exhausted. The relaxed, almost meditative mood of the Four of Cups, represented by the bottom cup, has given way given way to a darker, more brooding energy. That’s the black, melancholic cloak worn by the man. It makes sense that Kabbalists call the Five of Cups card the Lord of Loss in Pleasure. Astrologically, it is associated with Mars in Scorpio, which explains why the Five of Cups card exudes the gloominess of a Marilyn Manson song, who (Surprise, surprise!) happens to have Mars in Scorpio in his chart. The two cups behind him in the Five of Cups tarot promise that he will reconnect with his feelings and intuitions in time. In a reading, the Five of Cups card often suggests a loss from which you will recover partially or in full. You may even come out ahead. It’s a bittersweet card, taking the worst hurt out of a loss – and reminding you that every gain has its price. It’s okay to acknowledge your feelings of grief. Just keep in mind that what you are going through is not a complete disaster. The two cups behind you are still standing. What remains will be more than enough to start over, and it is not likely that you will be bounced back all the way to square one. A broken water main, for example, can damage many objects in your house beyond repair. But your home owners or renters insurance will at least compensate for the monetary value of your losses. And hypothetically speaking, an inheritance may leave you with a small fortune, but it also means that someone – perhaps even someone close to you – has died. Examining the circumstances of your loss – especially your emotions – will help you grow as a person. Knowing that you will weather this storm makes you stronger. Plus, you’ll learn a great deal about yourself. When you are done, remember to turn your attention to what’s still left. 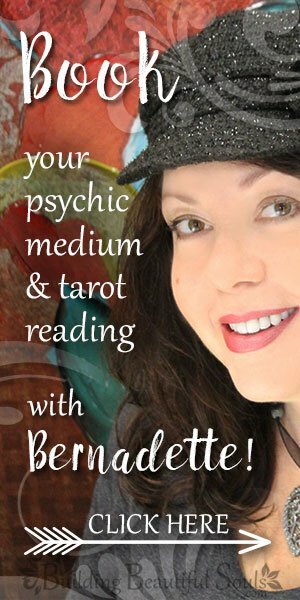 The Five of Cups tarot card also cautions you to be realistic about your hopes. If you’ve won the 200 million dollar jackpot, congratulations. Just keep in mind that Uncle Sam will help himself to about half of your winnings. Is Prince Charming about to sweep you off your feet? How wonderful. But don’t forget, he’s only a man. You may still need to train him to pick up his socks and put the toilet seat down. If those are sacrifices you’re willing to make in return for what you are getting, you’ll be all right. When reversed, the Five of Cups promises that a time of sorrow is coming to an end. Now the focus is shifting from the three spilled cups before you to the two full ones behind you. Your physical circumstances may be changing for the better. It could also mean that you have resolved an important psychological or spiritual crisis. Melancholy is usually a temporary condition. It comes and goes. In this sense, it is a lot like the energy of the Four of Cups tarot card, but at a slightly higher volume. Remaining in this state for too long can lead to depression. If you have chosen to seek help, things are about to get better. You will notice significant improvements soon. You are approaching a point where you can accept the past and let go of old hurts. As open wounds begin to heal, it is safe to forgive those who have wronged you. You may even be able to forgive yourself for things you have done – or should have done, but didn’t. Sometimes, melancholy implies a spiritual dilemma, perhaps even a crisis of faith. It’s a crisis you have now resolved. More importantly, you are willing to do the work necessary to get to where you want to be. Looking at the image in the background of the Five of Cups, you were on the “wrong” side of the river. You saw yourself in the barren wasteland, not knowing how to reach the small keep on the hill amid the shady trees: your spiritual home. Perhaps you have discovered the strength and courage to brave the rushing river in your way. Or seeing that bridge in the distance, you have decided that the long walk may well be worth it. Whatever your choice may be, the journey can now continue. You are now seeing options that will see you through a crisis at your workplace or in a relationship. Options you didn’t see before. Yes, it will take a little patience and a lot of work. But there is a light at the end of the tunnel. Kabbalistically, fives are attributed to Mars, the energy that upsets the applecart. In traditional Numerology, 5 corresponds to communicative Mercury. In the suit of Cups, these energies combine to remind you that your current brooding mood can be a creative process, if you are willing to accept is as such.